Where can I see my roommates? Roommates can always be reviewed on My Profile. 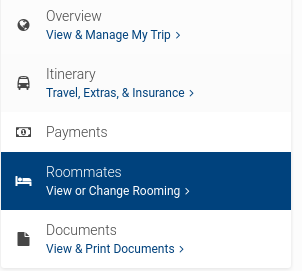 Once you're signed in, click Roommates on the left-hand side under My Trips. From there you will see two sections: Room Type and Roommates. Under the Roommates section you will be able to view the names of the travelers that are in your room. Want to make a rooming change? Review the article: How can I change my roommates?